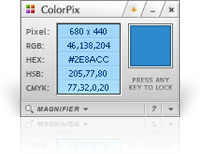 ColorPix is an excellent and professional color picker program which will help us to grab any color from the any part of our PC screen.It is designed to help users who often works with color and palette. You may choose an appropriate color from the palette and copy its value to the clipboard.ColorPix is a useful little color picker that grabs the pixel under your mouse and transforms it into a number of different color formats. 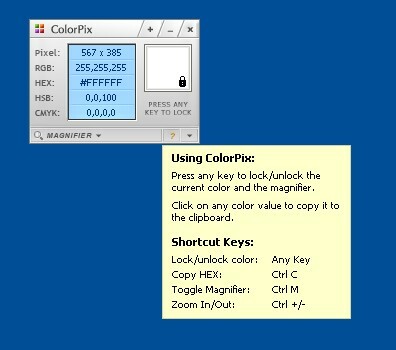 Color codes are show as the cursor is moved in the ColorPix window. A cursor click displays the color code in web Hex and decimal Red, Green, Blue, along with the color compliment.Sucessive clicks save the pixel colors in a list with user descriptions for review or printing. ColorPix is an essential utility for web page development.